Chute Canyon is located in the southern area of the San Rafael Swell between Green River and Hanksville, Utah. The trail through Chute Canyon is one of the easiest routes through the southern reef connecting the Behind the Reef Road and the Wild Horse Road. Even though the walls of the canyon never get closer than 3 or 4 feet its long meandering sections of narrows are a delight to hike through. To get to the trailhead drive 19.5 miles north from Hanksville or 24 miles south from Interstate 70 and turn west onto the Temple Mountain Road towards Goblin Valley State Park. At the 5 mile point rather than turning left onto the Goblin Valley Road keep going straight for another 2.3 miles and turn left onto the Behind the Reef Road. Follow the Behind the Reef Road for 6.3 miles to the Chute Canyon trailhead. The road is rough in places but typically doesn't require a high clearance vehicle or 4-wheel drive. At the 1.6 mile point the Behind the Reef Road passes the Wildhorse Canyon trailhead and at the 4.1 mile point it passes the Crack Canyon trailhead. From there it is another 2.2 miles to the Chute Canyon trailhead which is also the start of the Behind the Reef trail. High clearance 4-wheel drive vehicles can keep going for another 0.46 miles and park at some primitive campsites near a former mining site. From there the route is as simple as following the wash through Chute Canyon. With a base of sand and rocks the wash has a firm enough surface for some easy hiking. Just past the 1.3 mile point the trail crosses the boundary of the Wilderness Study Area. By the 2 mile point the canyon is getting narrower as it makes several 90 degree turns and wraps around a couple of switchback bends. In one narrow section there are some pioneer inscriptions etched into the dark patina on the canyon wall. The oldest inscription dates to 1888 while this one by Herbert Allred has a date of Jan. 9, 1906. Chute Canyon has a mostly flat bottom with no spillovers or ledges. It makes a perfect route for people on horseback to follow and at some time or other it may have even seen a herd or two of cows pass through. When you think that you should be popping out of the reef around the next turn the narrows seem to just keep going and going. Eventually the towering walls of Chute Canyon give way to the sloping flanks of the east side of the reef where the wash widens out and the landscape opens up. For this post we turned around at the boundary of the Wilderness Study Area where a 2 mile long trail branches off on the left that cuts over to Crack Canyon. 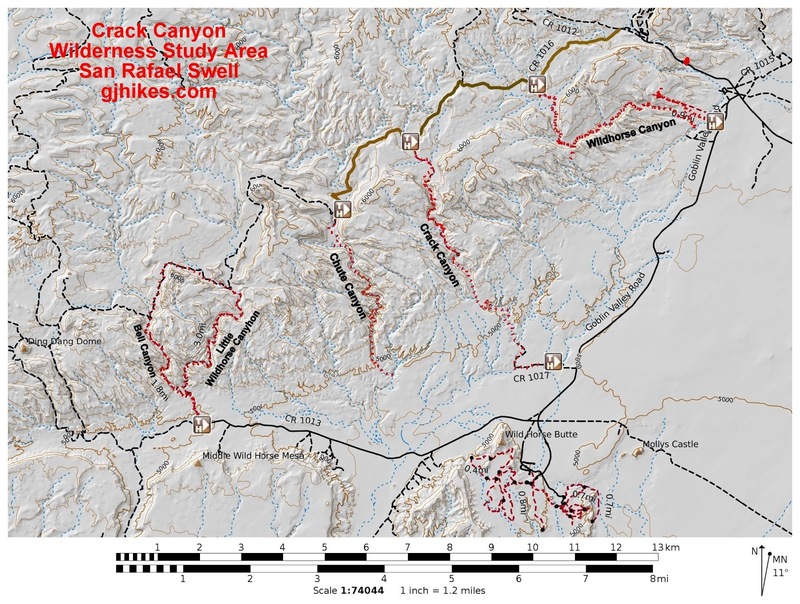 Backpackers and long day hikers can use the trail to make a big loop out of the Crack Canyon and Chute Canyon trails. Without a shuttle the loop is probably more than 14 miles. Backpackers should know better than camping in the washes of the canyons and the narrows should be completely avoided anytime there is a threat of thunderstorms in the area. Since Chute Canyon doesn't have any skinny slots like its neighbor Little Wild Horse Canyon it doesn't draw nearly as many visitors. In our opinion that means that a whole lot of people are missing out on a great hiking experience. The upper trailhead for Chute Canyon isn't nearly as accessible as the Little Wild Horse trailhead and since it requires a lot more time to get to and from it that probably also cuts down on the number of visitors it gets. 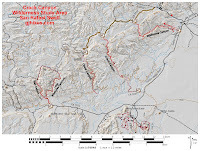 At some point we will check out the lower end of Chute Canyon, beginning off of the Wild Horse Road, as well as the connector between Crack Canyon and Chute Canyon. In the mean time hiking Chute Canyon from the trailhead on the Behind the Reef Road is a great way to experience the San Rafael Swell. If you would like to see it for yourself then all you have to do is saddle your horse or 'Take a hike'.